Went into the coop for lock up and and found that my flock had grown by two. The little red-head on the right is the chick I posted the video of in update 3.5. He/she is dry and fluffy. The blondie on the left is still partially damp. Of the three eggs still under Claire, the light colored one has a crack in it. It had that crack a day ago, though, so I don’t think it’s hatching. The brown one on the very left has a pip. The brown one in the middle wasn’t there earlier, and is NOT one of Claire’s eggs. So I removed it. But yay!!! Two babies!!!! And maybe another by tomorrow! So wonderful. 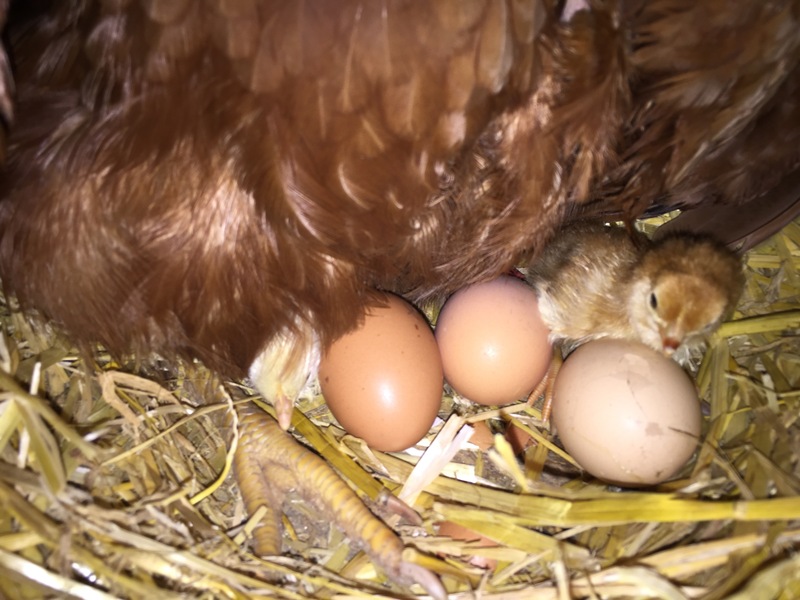 I have always wanted to let a chicken go broody and raise a clutch.